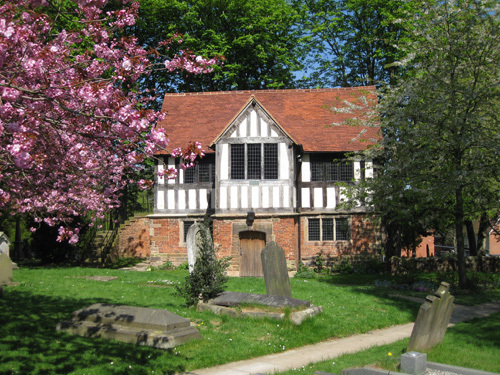 Standing alongside the 12th century parish church at the heart of Kings Norton are the prestigious Old Grammar School and 15th century timber framed Tudor Merchants House (pictured right). Together with St Nicolas Church, its churchyard and The Green they form the largest complex of medieval buildings in Birmingham. Guided Tours : Friday & Sat: 11am and 2pm. No need to book. Time 1¼ hrs approx. Cost . £5. Concessions £4. Children under 12 free. Booked Group Tours: At any time by arrangement. Meal deals, tea/coffee & cakes, buffet lunch, or more. Cost £4 per person + meal deal by arrangement. Saint Nicolas Place is open for heritage visitors on Tuesday to Saturday 10am to 3pm. Guided tours Friday and Saturday at 11am and 2pm. The Saracen’s Head café is open Tuesday to Saturday 10am to 3pm. Disabled access and nearby disabled parking spaces. Train: to Kings Norton Station and then No. 18 bus to the church. Car/coach: off A441 at Kings Norton. Cars: Free car park Pershore Rd 3mins walk away.